Nahki Wells scored twice as Huddersfield battled back from two goals down to earn a point at Ipswich. Tommy Smith put the hosts ahead with a header from Teddy Bishop's cross. Smith almost made it 2-0 after he deflected Bishop's free-kick onto the post before Christophe Berra converted Jonathan Parr's cross from close range. Wells got the first of his two goals from the penalty spot before he levelled with a header from Sean Scannell's cross. Grant Holt should have given the Terriers a 13th-minute lead but he poked a shot wide of the far post. Ipswich took the lead with their first effort on target, after a succession of corners ended with Bishop's cross finding the head of Smith, who nodded in at the near post. Wells saw a shot was blocked by Dean Gerken and the rebound came at him too quickly as he headed over. He later had Gerken scampering across his goal in injury time, when his audacious first-time volley from an acute angle was tipped around the post by the alert Ipswich keeper. Ipswich doubled their advantage nine minutes after the restart when David McGoldrick controlled Parr's pass and the striker's low cross was turned in by the unmarked Berra from close range. Huddersfield got themselves back into the game when a deep cross into the area saw Luke Chambers and Holt go to ground and referee Richard Clark pointed to the spot. Wells made no mistake from 12 yards before substitute Harry Bunn shot at Gerken's legs as Huddersfield went for the equaliser, which eventually came with eight minutes remaining. Substitute Scannell's cross found Wells, who headed home from the edge of the six-yard box. Ipswich manager Mick McCarthy: "We were maybe fortunate to come away with a point. It was very disappointing. "Frustrations were running high after the game but this is the same squad of players who cost nothing and were in the top six. "Everyone enjoyed that but now we are having a little bit of a tough period. We need everyone to get behind us. "I was very angry in the dressing room but I will look at it again on Monday and then move on." 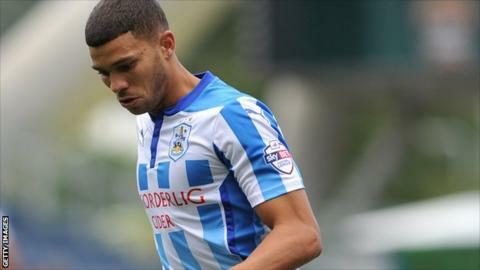 Huddersfield manager Chris Powell: "That was exactly the response I wanted from Nahki. "He has not played for tactical reasons but he is a goalscorer and you always want them in your squad. "He could have actually had a hat-trick and maybe more when he looks back at the game, but I will settle for two. "We deserved at least a point and we could have had a winner. I was very pleased with the performance, even when we were behind." Match ends, Ipswich Town 2, Huddersfield Town 2. Second Half ends, Ipswich Town 2, Huddersfield Town 2. Foul by Stephen Hunt (Ipswich Town). Attempt missed. Harry Bunn (Huddersfield Town) left footed shot from the right side of the box is too high. Assisted by Tommy Smith. Grant Holt (Huddersfield Town) wins a free kick in the attacking half. Offside, Huddersfield Town. Grant Holt tries a through ball, but Sean Scannell is caught offside. Substitution, Ipswich Town. Stephen Hunt replaces Luke Hyam. Attempt missed. Nahki Wells (Huddersfield Town) left footed shot from the centre of the box is too high. Assisted by Harry Bunn. Goal! Ipswich Town 2, Huddersfield Town 2. Nahki Wells (Huddersfield Town) header from very close range to the bottom right corner. Assisted by Tommy Smith with a cross. Attempt saved. Daryl Murphy (Ipswich Town) header from the centre of the box is saved in the bottom right corner. Assisted by Cole Skuse. Attempt blocked. Cole Skuse (Ipswich Town) left footed shot from outside the box is blocked. Assisted by Daryl Murphy. Grant Holt (Huddersfield Town) wins a free kick on the right wing. Attempt missed. Daryl Murphy (Ipswich Town) left footed shot from outside the box is close, but misses to the left. Assisted by Luke Chambers. Paul Dixon (Huddersfield Town) wins a free kick in the attacking half. Substitution, Ipswich Town. Jay Tabb replaces Conor Sammon. Attempt saved. Harry Bunn (Huddersfield Town) left footed shot from the left side of the box is saved in the centre of the goal. Assisted by Grant Holt. Attempt blocked. Paul Dixon (Huddersfield Town) right footed shot from outside the box is blocked. Assisted by Jacob Butterfield. Goal! Ipswich Town 2, Huddersfield Town 1. Nahki Wells (Huddersfield Town) converts the penalty with a right footed shot to the bottom left corner. Penalty Huddersfield Town. Grant Holt draws a foul in the penalty area. Penalty conceded by Luke Chambers (Ipswich Town) after a foul in the penalty area. Luke Hyam (Ipswich Town) is shown the yellow card. Attempt missed. Conor Coady (Huddersfield Town) left footed shot from the right side of the box is too high. Assisted by Tommy Smith. Offside, Huddersfield Town. Grant Holt tries a through ball, but Nahki Wells is caught offside. Substitution, Huddersfield Town. Sean Scannell replaces Lee Peltier. Substitution, Huddersfield Town. Harry Bunn replaces Jonathan Hogg.